BackgroundOral health related quality of life (OHRQoL) research among children and adolescents in Lithuania is just starting and no measures have been validated to date. Therefore, this study aimed to validate a Lithuanian version of the full (37 items) Child Perceptions Questionnaire (CPQ11–14) within a random sample of children aged 11 to 14.MethodsA cross-sectional survey among a randomly selected sample of schoolchildren (N = 307) aged 11 to14 was conducted. An anonymous questionnaire included the full CPQ11–14 and items on global life satisfaction, oral health and oral life quality self-rating. The questionnaire was translated into Lithuanian using translation guidelines. In addition, an item on the oral pain was modified identifying the pain location. Standard tests (Cronbach’s α, construct validity and discriminant validity), supplemented with both exploratory and confirmatory factor analyses, were employed for psychometric evaluation of the instrument. The questionnaire was also tested by comparison students’ and their parents’ (N = 255) responses about oral symptoms and functional limitations.ResultsThe modified Lithuanian version of CPQ11–14 revealed good internal consistency reliability (Cronbach’s alpha for the total scale was 0.88). The measure showed significant associations with perceived oral health status and oral well-being, as well as with global life satisfaction (p < 0.01). Discriminant validity of the instrument was approved by comparison of children’s groups defined by self-reported caries experience and malocclusion. 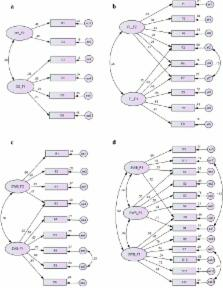 Factor analysis revealed a complex structure with two or three factors in each of four domains of the CPQ11–14. Excellent or acceptable levels of indices of model fitting with the given data were obtained for oral symptoms, functional limitations and emotional well-being domains, but not for the social well-being domain. A significant association between child and parental responses was found (intraclass correlation coefficient was 0.56 and 0.43, correspondingly in domains of oral symptoms and functional limitations).ConclusionThe Lithuanian version of the CPQ11–14 (with a modified item that identifies location of oral pain) appears to be a valid instrument to be used in further studies for measuring OHRQoL among 11 to 14 year old children in Lithuania.Electronic supplementary materialThe online version of this article (10.1186/s12903-018-0701-5) contains supplementary material, which is available to authorized users. Socioeconomic inequalities in adolescent health have been little studied until recently, partly due to the lack of appropriate and agreed upon measures for this age group. The difficulties of measuring adolescent socioeconomic status (SES) are both conceptual and methodological. Conceptually, it is unclear whether parental SES should be used as a proxy, and if so, which aspect of SES is most relevant. Methodologically, parental SES information is difficult to obtain from adolescents resulting in high levels of missing data. These issues led to the development of a new measure, the Family Affluence Scale (FAS), in the context of an international study on adolescent health, the Health Behaviour in School-Aged Children (HBSC) Study. The paper reviews the evolution of the measure over the past 10 years and its utility in examining and explaining health related inequalities at national and cross-national levels in over 30 countries in Europe and North America. We present an overview of HBSC papers published to date that examine FAS-related socioeconomic inequalities in health and health behaviour, using data from the HBSC study. Findings suggest consistent inequalities in self-reported health, psychosomatic symptoms, physical activity and aspects of eating habits at both the individual and country level. FAS has recently been adopted, and in some cases adapted, by other research and policy related studies and this work is also reviewed. Finally, ongoing FAS validation work is described together with ideas for future development of the measure. Modification and psychometric examination of a self-report measure of fear in older adults. Validation of the intestinal part of the prostate cancer questionnaire "QUFW94": psychometric properties, responsiveness, and content validity.